It’s the final frontier in food. For years, we’ve tinkered with the food supply to produce seedless bananas, grapes, and watermelon. We’ve bred chickens to create bigger, tastier birds with more meat on their bones. We’ve bred cows to be larger, slower, and tastier. We’ve done a whole lot of interference with the food supply in an attempt to get more food on the same animal, but the one thing that the FDA has been very careful to avoid is genetically-engineered food. 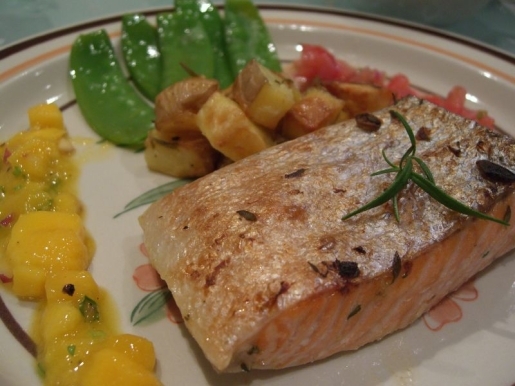 Now, the FDA is considering approving genetically-engineered salmon for human consumption. The salmon is the product of a company called AquAdvantage Salmon. basically, they’re taking normal salmon and injecting it with growth hormones to shorten the maturation process from 30 months to 16-18 months. If approved, this will be the first genetically modified food approves for human eating in the United States, and will no doubt kick down the doors to a host of previously-banned GM meat, veggies, fruit, and grains. Critics claim that more study is needed to determine if the increased hormone levels would cause health issues in humans.